Two new reviews – a movie about the black life and one about the white life, both in California. 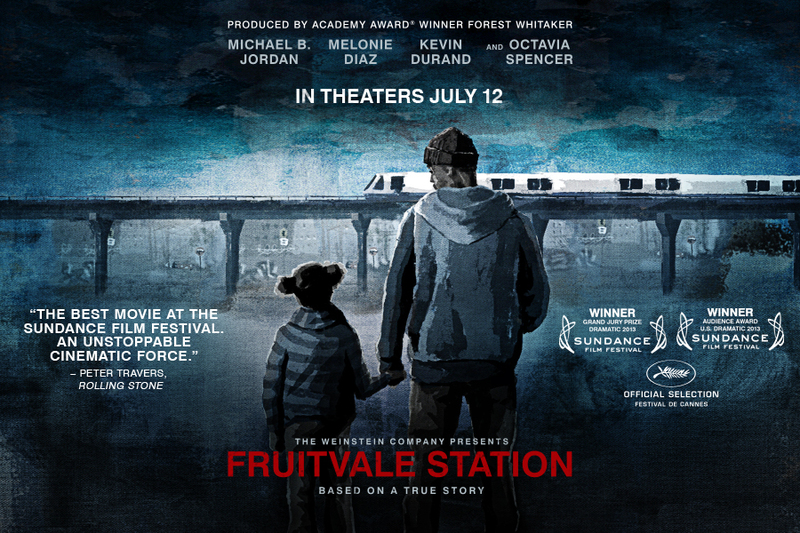 Ryan Coogler’s Fruitvale Station is an intriguing film; it might be said that it’s a minor examination of a major subject, or at least an intimate one. It could even be described as somewhat experimental, in that it certainly eschews the kind of dramatic structure screenwriting manuals would preach. It has something to say and a story to tell, certainly, but it does both quietly and originally. I will never forget seeing the shooting of Oscar Grant on YouTube, captured by a San Francisco BART (metro train) passenger on their phone. If you’re unfamiliar with the footage and the story (and it was obviously reported much more fully in the US than in the rest of the world), Grant was shot by a policeman in plain view of hundreds of onlookers in the early hours of New Year’s Day while handcuffed and lying face down on the subway platform at San Francisco’s Fruitvale Station. The footage is so crazy, so blatant – a cop shooting a man who has already been completely subdued – that I wondered if it was some sort of weird hoax, that someone had mocked it up, or at least added the handgun’s freaky pop into the sound mix. 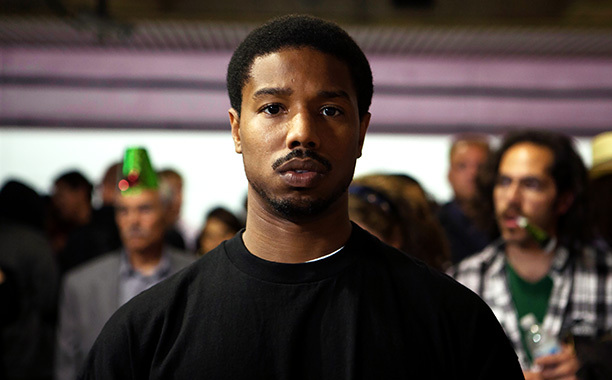 Well, the footage was real enough, and it opens Fruitvale Station. What follows is a dramatic reconstruction of the preceding twenty-six hours, focussing entirely on Grant. We see him go through his long, at times complicated, at times routine New Year’s Eve day, and along the way we learn the story of his life as it is right now: his relationships with his girlfriend, his daughter, his mother, his brothers and his friends; his recent firing from his menial job, his pot-dealing, and, in a flashback-within-a-flashback (because essentially the whole film is a flashback from that opening, real footage), his one-time incarceration. It is the portrait of a particular type of Oakland, California life, one where family and friendship are of optimum importance (it happens to be his mother’s birthday, but it is obvious Grant’s relationship with his mother is a strong one), where families start young, and where casual law-breaking is the norm, from dealing the extremely “soft” drug of weed to leaping the turnstile on the BART rather than paying the paltry fare. If the film wasn’t framed by Grant’s tragedy (it cycles back to Fruitvale Station, but to a recreation of the events rather than the real footage) and was simply a day in the life of a young black man, it would be too slight to warrant existence. Here, context is everything. Grant was’t exceptional, abnormal, dangerous or in anyway extreme, and it is his very normality that heightens the brutal sadness of his completely senseless – and bizarre – slaying. Michael B. Jordan plays Grant with pure and unstudied naturalism, Melonie Diaz is likewise utterly believable as his girlfriend Sophina, and Octavia Spencer, the only recognisable face in the cast, is excellent as his mother Wanda. The cops involved in “the incident” are seen briefly but perfectly played by Kevin Durand and Chad Michael Murray. Grant’s friends, mainly seen in the last third of the film, fill their roles with laid-back, easy-going charm and subtlety. It all feels very real. There are a couple of scenes along the way that seem a little too dramatically pat for real life, and I questioned their veracity and their dramatic effectiveness. And, given we know the ending from the beginning, and given that the film doesn’t so much tell a story as paint a portrait, it is definitely deserving, indeed demanding, of its sleek running time of 85 minutes – anything longer and it would have run the risk of losing our interest along the way. But the film’s final scenes, the ones we all know are coming, are as dramatic as anything you can put on film, and devastating. The film doesn’t offer answers, it doesn’t preach and it doesn’t particularly burn with anger; it is certainly not sensationalistic – in fact it’s extremely tasteful, respectful and restrained. It’s really quite unique, and definitely worth seeing for many reasons, not just as the story behind a tragedy, but as an intimate look at a lifestyle that for a certain percentage of the American public is daily reality, but for many others – myself included – is just far enough removed to be fascinating. Nicole Holofcener’s films have a distinct voice, and if you respond to it, you may well find Enough Said extremely satisfying. I did not, and instead found it suffered from the same irritations her other films, including Friends With Money, Please Give and Lovely and Amazing, have arisen in me. Simply put, I don’t respond well to her characters, milieus and situations; a lot of people do, so, it has to be said more so than usual, my response to her films – and Enough Said – really does come down to a matter of taste. 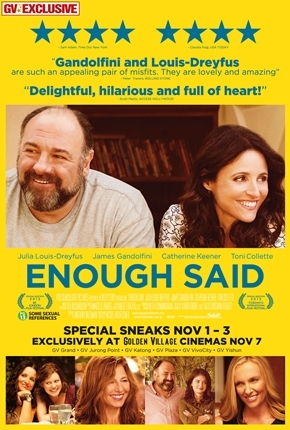 Julia Louis Dreyfus and James Gandolfini – both excellent – play a couple of divorcees, both of whom are about to lose their daughters to college, who meet at a party and start a relationship. The kicker – and it’s really quite a “high-concept” one for such a low-key film – is that, at the same party, Drefuss’ Eva also meets Gandolfini’s Albert’s ex-wife, and becomes her masseuse, without putting two-and-two together – until she does. By that time, the ex-wife, Marianne (played by Holofcener stalwart Catherine Keener, at her most Catherine Keener-esque) has made enough dispiriting comments about Albert that Eva is thrown into doubt: could the man she finds so attractive actually be the monster Marianne is constantly portraying? I simply don’t buy Holofcener’s characters or their environments; the ex-wife is a poet who lives in a gorgeous Californian home, and Albert is a film archivist who drives an Audi. But it’s not just the material worlds of these people that don’t ring true for me; more than most characters, they feel like characters, “written” characters, behaving to an author’s whims rather than being allowed to breathe. Although Holofcener writes her screenplays as original texts, they feel literary, as though adapted from books that were better off not filmed. The music is very cloying – and annoying; the pace is slow and, for what is definitely meant as a comedy, I personally didn’t find it that funny (although I did laugh out loud at least four times, at least in the first half, and that’s a better hit rate than most studio rom-comes, without a doubt). 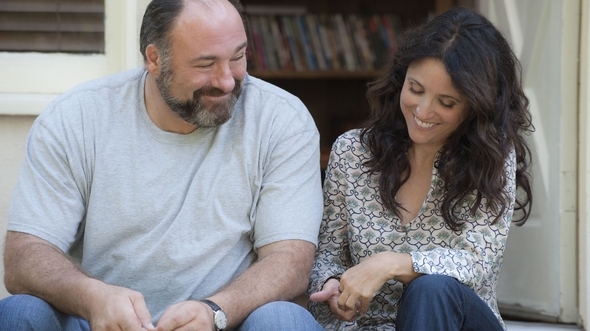 It deserves points for portraying middle-aged romance, and the two leads are so good (Gandolfini is particularly terrific) that they manage to make the contrivances somewhat bearable. Unfortunately, the same can’t be said for Keener; once such a startling and unique actress (mind-blowing in Being John Malkovich, for example) she seems now to play the same role over and over, or at least employ the same mannerisms, vocal lilts, expressions and general performance qualities that all her roles feel the same; she is one step away from self-parody, and has, I hate to say, already achieved a boring stasis. In many ways, Catherine Keener’s general traits as a performer these days match Holofcener’s films perfectly (and not just because they’ve been such consistent collaborators): once again, Enough Said concerns itself with a type of intellectualised bourgeois hippie class; the characters are nieces and nephews of Woody Allen’s, only marginally less wealthy, certainly as talkative, but with less (or no) makeup, bare feet and lots of bangles, long straight hair and flowing, colourful blouses. 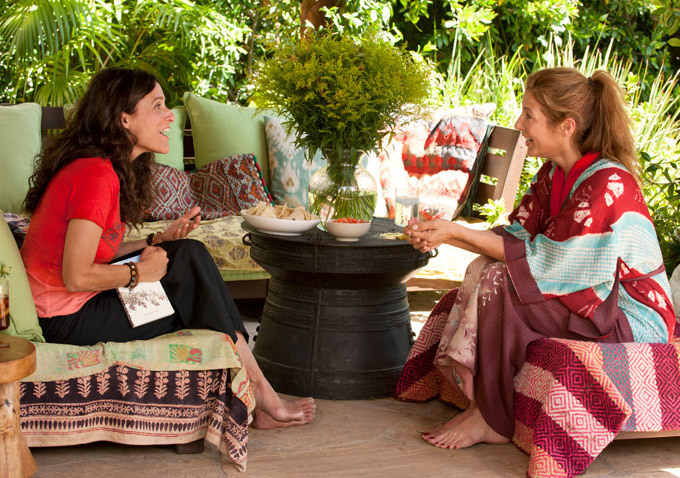 All the interiors are impeccable, all the exteriors are dazzlingly dappled with gorgeous Californian sun, and the characters, for me at least, are completely unbelievable, even as they strive to sound like real life. Perhaps the effort that’s gone into this fumbling, so obviously overwritten “naturalism” is what reminds you more than ever that you’re actually just watching a movie.